Compatibility: Only fit for Dyson DC58/DC59/V6/V7/V8 Model, please check the Model of your vacuum cleaner before taking order. Note: Although this filter replacement is not Dyson OEM parts, with good quality and same functionality, they work as well as the original parts. Please be at ease to place order. 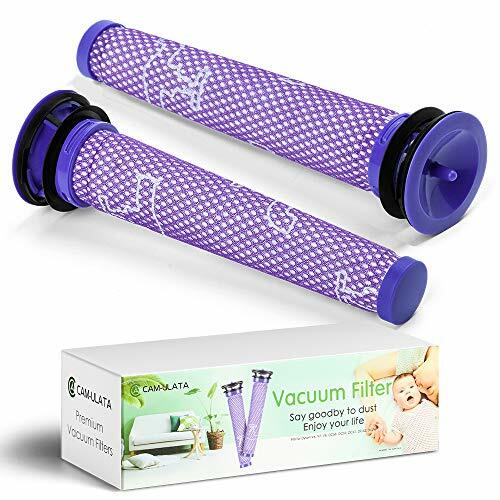 Compatibility: our Dyson filter replacement fit for Dyson V8 Absolute, V8 Animal, V7 Absolute, V7 Motorhead, V7 Animal, V7 Animal plus, V6 Absolute, V6 Animal, V6 Animal Extra, V6 Motorhead, V6 Motorhead Exclusive, V6 HEPA, V6 Cord-free, V6 Baby+Child, V6 Car+Boat, V6 Top Dog, V6 Trigger, DC59 Animal Exclusive, DC59 Animal V6, DC59 Motorhead, DC58, DC61 and DC62. Replacing Parts: # 965661-01; maintain your Dyson Vacuum Cleaner operating at peak performance. Recommended to replace its pre-filter every three or six months. MAXIMUM COMPATIBLE WITH ORIGINAL MACHINE. Breathing Clean Air at Home: This Dyson filter replacements effectively remove small dust, dirt, pollen,cigarette ash for reducing the secondary air pollution, allowing you to enjoy clean and fresh air at home. Washable and Reusable: The Dyson vacuum cleaner filters are washable and reusable; please note that they should be better re-installed until becoming totally dry after washing. 100% Satisfaction Guarantee: Not satisfied, could return without any reason. We can also resent you new dyson cordless filter kit FOR FREE due to quality problems. If you have any questions about this product by CAM-ULATA, contact us by completing and submitting the form below. If you are looking for a specif part number, please include it with your message.